Christmas polish posting continues with the latest from Color Club. Enchanted Holiday is a set of four mini (but still good size- .25 oz- half size!) Color Club shades plus a sheet of adorable Christmas decals which sadly I don't have a picture of. The kit is accompanied by a little set of holiday gems for nail art- little stars and beads and jewels. Which, if I wasn't in a complete creative slump, I could totally use to do some cute Christmas nail art. Actually, I have one idea for a design, I might just have to give it a try.... Anyway, the polishes! Enchanted Holiday. Gold glitter in a clear base. Bright and shiny! Magic Elf. This color is AMAZING. Look at it! It's insane! Light green and dark green tones with tons of iridescent gold sparkles. It's almost a foil it's so sparkly, but it doesn't have a metallic silver base like most foils. Just super shiny sparkly crazy green and gold. Now, the rest of the colors in this collection appear to be re=promoted Color Club shades, but I can't say I've seen this one before. Wonder if it will ever be released in full size? Snowflakes. A light opalescent glitter in a slightly shimmery milky sheer base. Great for layering but it will lighten the color you layer it over because of the clear/whitish shimmer in the base. Looks nice alone, but I should have done three coats instead of two. Reminds me a bit of China Glaze Glacier. Wish List Red. Obligatory Christmas/Holiday collection Ruby Pumps clone. Not that that's a bad thing because the color is gorgeous. 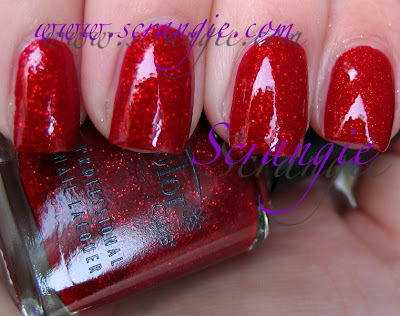 Fiery red glitter in a candy red jelly base. Really can't go wrong with this color. As usual, the formula was great. Not too thick, not too thin, applied easily. Color Club minis do have a small brush but it seems to hold a decent amount of polish and doesn't give me much trouble. I do like that color club minis are .25 fl oz- a full size is usually .5 fl oz- sometimes minis are smaller than half size which can make them harder to use and you get less polish. Drying time on these shades is good. Enchanted Holiday and Snowflakes are definitely on the gritty side and will need a little extra topcoat to smooth. Cute set, I love the decals! Hopefully I'll be able to do something cute with them soon and post it. While we have seen three out of the four shades in this set, I think it's totally worth getting for Magic Elf alone. Now I'm starting to worry about having to ration my mini bottle of Magic Elf... Really hope I can get that in full size soon! Wish List Red is so pretty! Wowww gorgeous colors...love that gold glitter!! That green is gorgeous!! It looks different from any green I have in my collection. Snowflakes reminds me of Wet and Wild's Hallucinate. Still pretty though. I love magic elf! Snowflakes reminds me of Wet and Wild's Hallucinate. Both look super pretty. I love magic elf! I got this set as soon as it was available online, lol. I think that was in October or September! I agree that Magic Elf is absolutely amazing. Out of all my greens, I think it's my favorite! I am DYING for Magic Elf to be released full size! PLEASE COLOR CLUB!!! I *need* Magic Elf. It's stunning! Magic Elf is the best!! All so pretty. Love Color Club's glitters. I just love holiday collections. These have been on my WL forevvver. I need to bite the bullet and just buy them. That green is haunting my dreams and you can never underestimate the value of a good gold glitter.